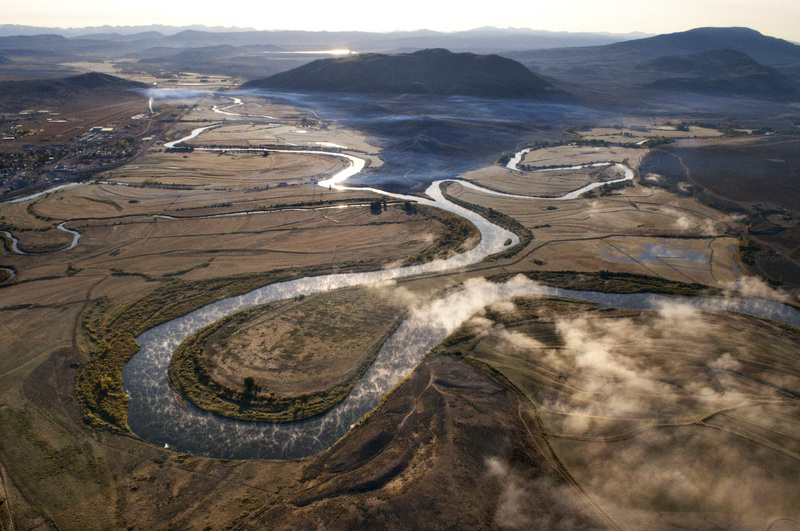 A mist rises over an oxbow of the Colorado (left) and Blue Rivers, near Kremmling just before the steep drop into Gore Canyon, looking east to the Williams Fork Reservoir (top center). . The Colorado River travels 1415 miles from this point, just below its headwaters in the Rocky Mountains. Here the Colorado is surrounded by nearly a dozen reservoirs, collectively referred to as the Great Lakes. Recently, a rancher above the confluence opened his head gates to irrigate and depleted that day's river flow, along with its gold-medal trout fishing.